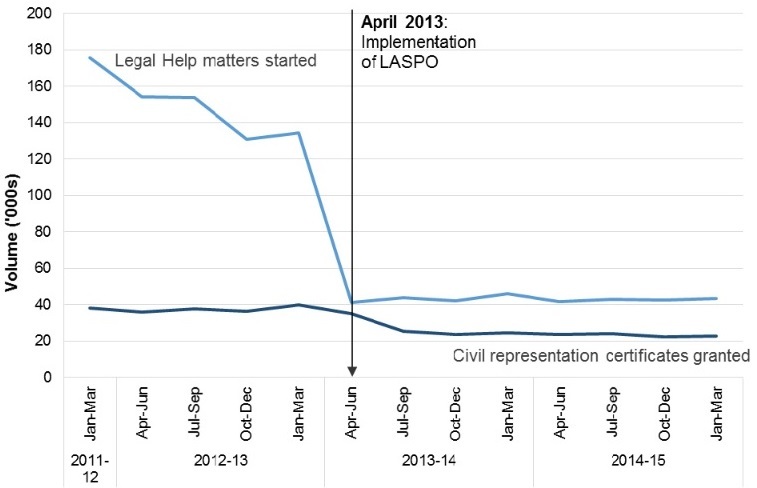 Back in 2013 we wrote about the cuts to legal aid introduced under the Legal Aid Sentencing and Punishment of Offender Act (LASPO). The cuts were mainly to civil legal aid which was virtually abolished for some areas of law such as employment, welfare benefits, and non asylum immigration. Legal aid was retained in other areas of law such as divorce, housing and clinical negligence but the types of cases for which legal aid could be granted severely reduced. The result was that hundreds of thousands of people who were previously eligible for legal aid could no longer get it. It was a gift for unscrupulous employers, landlords, and vicious and /or incompetent government officials in departments such as the Department of Work and Pensions and the Home Office, who have been able to refuse applications for benefits or refuse to grant immigration rights more or less with impunity, in the knowledge that applicants will find it almost impossible to afford representation for an appeal. As well as the scope cuts, increasing numbers of people are financially ineligible for legal aid because of the government’s deliberate failure to uprate the maximum income level at which someone is too ‘wealthy’ to qualify for legal aid. Recent research published by The Law Society shows that even people whose income is below the Minimum Income Standard (a measure of minimum acceptable living standard) can be financially excluded from legal aid altogether, or cannot realistically afford what can be substantial contributions that often have to be paid even when legal aid is offered. This applies to both civil and criminal legal aid. People accused of serious crimes may have to pay substantial contributions for representation in the Crown Court. Some can’t afford to pay and have no choice but to defend themselves against the State’s prosecutors, a situation that no one whose liberty is on the line should be forced into. Legal aid was first introduced in 1949 by the post-war Labour government. Along with the NHS, universal free education, and social security, it was one of the key features of the welfare state. Although these reforms provided benefits for workers, this was not the great victory for the working class, or step towards socialism that the Labour Party and its hangers on would have us believe. However the ruling class were mindful of the revolutionary outbreaks that marked the end of the First World War, and were fearful of further revolutionary turmoil following the end of World War 2. Although the level of class struggle was nowhere near as high as at the end of the First World War, the revival of workers struggles towards the end of the war from 1943 in Italy through to strikes in various areas of UK indicated that the working class still had revolutionary potential. Also any failure to move of from the desperate social conditions of the 1930s would have been a gift to Stalinism at a time when many workers still had illusions about the socialist nature of the USSR. The answer to the Stalinist state capitalism was the Keynesian state capitalism of the “mixed economy”. At a time when the Cold War was about to begin, large scale sympathy for the USSR could have posed a serious threat to the interests of the British ruling class. The welfare state as well as having the political function of appearing to be a concession to the working class, was also functional to the facilitation of the smooth running of capitalism in the post war re-construction period; healthier, better educated workers are more useful to the system. With social justice “sorted” the Cold War debate could be shifted on to the terrain of “freedom”. Legal aid helped to play a part in this. In this sense it is functional to the well being of capitalism, If workers believe they have legal rights that can be enforced in a democratic state, they are more likely to think they have a stake in that society and belief in ‘justice’ than if they are effectively excluded from the justice system. Thus legal aid helps to maintain the ruling class’ cherished notion of the ‘rule of law’ where the law whilst guaranteed by the democratic state, stands above it dispensing justice on the basis of fairness without regard to political or class interests. It is a convenient fiction which disguises the class nature of law itself but one that is a key ideological weapon in the defence of liberal democracy. So it’s quite a big deal if faith in the rule of law starts to break down. The legal aid cuts of 2013 slashed the then legal aid budget of £2.2 billion by some £700 million, actually exceeding the government’s savings target. But this comes at a price, and increasingly there is concern within legal circles that the cuts have gone too far and could actually be counter productive. There is evidence particularly with regard to family and social welfare law that lack of legal advice has knock on costs, for example it is cheaper to advise a tenant on how to avoid possession proceedings than for that tenant and their family to be evicted, which then places a duty on their local authority to re-house them. It can also be cheaper to assist parties to reach a settlement in family proceedings rather than to have a protracted dispute which impacts on children and potentially their educational and emotional well being. There is clear evidence of a substantial increase of people representing themselves in court since 2013, particularly in family proceedings , which puts a greater burden on the ailing civil court system, even some senior judges are concerned. But perhaps the most worrying thing for our rulers is the fear that respect for the rule of law itself will break down and people will take the law into their own hands. This does not mean that as revolutionaries we are indifferent to the legal aid cuts or might even think they are a good thing if they hasten the breakdown of bourgeois society. In all probability we are some way off from a revolutionary situation, and in the meantime, the legal aid cuts as well as all the other welfare cuts are causing real hardship and misery for millions of workers and their families. We support genuine grass roots opposition to the cuts, sometimes they can be reversed, although often temporarily or at the expense of something else, so it is a constant struggle. Such struggles carry within them the potential for a wider and more conscious challenge to the rule of capital. Our role is to be part of the process of creating a revolutionary party that can assist the development of that revolutionary consciousness and organisation, not just to get rid of capitalism but to create a socialist alternative.